A review of John Chrysostom’s works as it relates to the Christian doctrine of tongues. His works on the doctrine of tongues is not so cut-and-dry as many portray him. A further look demonstrates far more complexity with grey areas and questions that remain unanswered. This fourth-century Church Father is one of most quoted authors of the subject. His popularity on the topic is due to the great reverence associated with his name, the easy access of English translations, and his connection to miracles by the highly influential eighteenth-century writer Conyers Middleton. However, Chrysostom’s work is not a primary source that many have elevated it to. There are much better sources elsewhere. 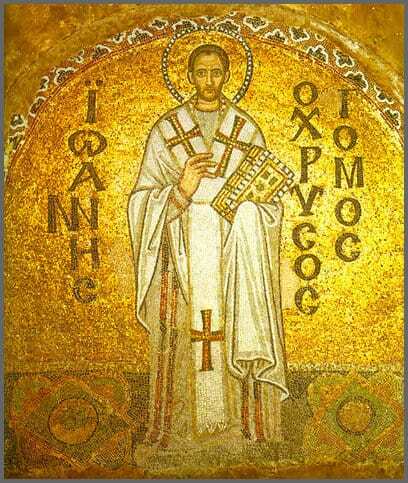 Who was John Chrysostom and what did he contribute to the subject? John got the title Chrysostom — which means golden mouthed, not because it was his last name, but to his great eloquence. This term was applied to him well after his death. Anyone reading one of his homilies can tell that he had the intellectual acuity combined with public acumen, and articulate speaking skills. He is one of the few that spoke or wrote in the first person within the community of ecclesiastical writers. He was considered the defacto standard for all that followed him in the Eastern Byzantine Christian world. This is a look at his coverage of the subject with three important questions to be answered. Did he believe that miracles had ceased in the Church altogether and so the idea of Christian tongues in the contemporary Church is moot? What did he think happened at Pentecost? Was it the instant ability to speak in foreign languages, or was it something else? What did he think of the Corinthian problem of tongues? Did he recognize or argue against the Montanist practice of tongues? The Montanist question will be answered first because it is the simplest. He didn’t recognize any Montanist contribution to either tongues or miracles in any of his texts. Chrysostom clearly defined the doctrine of tongues as the spontaneous utterance of a foreign language unknown beforehand by the speaker. There was no concept whatsoever of a private, ecstatic or heavenly prayer language in his coverage. His answer was that signs were for the unbeliever. The faithful require no external signs for assurance because the Christian life is an internal matter of the heart and mind. If one depends on signs as the most important factor in personally knowing God, or as the stimuli that motivates in the Christian life and witness, then signs and miracles are the guiding force in life. It becomes the central part of one’s identity which must constantly be pursued. Chrysostom favored the ascetic inward life of devotion, acceptance, and good deeds as the guiding principle in the Christian life over being directed by external signs. Miracles and signs were too abstract and impersonal as a framework for daily Christian living. This is a leading statement by those of the cessationist movement who believe the supernatural era was completed at the founding of the Church. This belief concludes that the miracle of tongues did not perpetuate itself after this. Therefore, it is not necessary to trace the definition, or evolution of the doctrine of tongues because anything defined after the first century is based on a false supposition. The fourth century leaders Chrysostom, and Augustine, along with the fifth century Cyril of Alexandria carried similar thoughts on the subject, though each one represented this concept slightly different. Augustine restricted his opinion that only the individual expression of tongues had ceased, not the corporate one. Other miracles such as healing, prophecy, etc., were still viewed as operative.3 Cyril of Alexandria held that the miraculous endowment of languages at Pentecost was a temporary sign for the Jews. Those that received this blessing continued to have this power throughout their lives, but it did not persist after their generation.4 The association between these three demonstrates that there must have been an interpretive movement of this kind in the fourth and fifth centuries that bordered on a universal thought. However, there are problems. It doesn’t take into account the tongues-speaking experience of the fourth century Egyptian Monastic leader, Pachomius. The writers of this account display him speaking miraculously in an unlearned foreign language, and no one in antiquity has disputed or countered the theological legitimacy.5 Basil of Seleucia who tried 50 years later to emulate Chrysostom’s style and wrote a commentary on Pentecost, did not overtly carry on this tradition,6 but then he didn’t disprove it either. It was simply omitted in his coverage. Neither was the doctrine found in eighth century John of Damascus texts, who liberally borrowed from Chrysostom’s works.7 However, this is from a small sampling, more materials may come up on these two I haven’t read that may contradict my opinion. Michael Psellos in the tenth century failed to recognize any of these three in his comprehensive coverage on tongues, choosing to exclusively follow Gregory Nazianzus.8 On the other hand, Thomas Aquinas in the thirteenth century sided with Augustine that the miracle of tongues had switched from an individual, to a corporate expression.9 These examples demonstrate that the cessationalist doctrine of tongues was dominant and powerful during the fourth and fifth centuries, but it was not universal. It did perpetuate, but it was not the defacto standard. The one who captivated this doctrine for centuries was Gregory Nazianzus. His technical approach can be traced in Christian literature for well over a thousand-years. He did not address whether tongues ceased or perpetuated, he solely concentrated on the mechanics on how this miracle operated at Pentecost. For more information on Gregory Nazianzus on the doctrine of tongues, see, Gregory Nazianzus on the doctrine of Tongues Intro. The earliest that Chrysostom’s name prominently recirculated after the fourth century in connection with miracles and the doctrine of tongues was by the English Church historian, Conyers Middleton, who wrote the controversial and game-changing 1749 work, Divine Inquiry. Middleton outlined that signs and miracles have not occurred since the time of the apostles. It was written both as an antidote against the excesses of Christian mysticism during his time and the establishment of the Protestant identity separate from the Roman Catholic authority. His scant reference to Chrysostom in the above work, along with more details found in, An Essay on the Gift of Tongues,10 gained attraction to Chrysostom’s thoughts on the subject after a long slumber. The concept became a stolid symbol for the conservative protestant identity in 1918, when the last theological leader of a united Princeton Seminary, B.B. Warfield, published, Counterfeit Miracles.11 Warfield utilized Chrysostom as a champion of that cause. The golden mouth preacher found a prominent proponent which renewed an interest in his works within the western world. The theological idea of cessation grew prominent in many theological circles and today is known as cessationism. Another dynamic may be the idea of political stability. The central authority of the Church was based on literature, liturgy, ritual and offices, which were uniformly observed and established. If signs and wonders became the central focal point, it would have severely challenged the structure of the Church and could bypass established leadership, and all other established principles. I Corinthians 14:3. . . .And it was thought great because the Apostles received it first, and with so great display; it was not however therefore to be esteemed above all the others. Wherefore then did the Apostles receive it before the rest? Because they were to go abroad every where. And as in the time of building the tower the one tongue was divided into many; so then the many tongues frequently met in one man, and the same person used to discourse both in the Persian, and the Roman, and the Indian, and many other tongues, the Spirit sounding within him: and the gift was called the gift of tongues because he could all at once speak various languages. . . It is consistenly found in Chrysostom’s hermeneutic that the tongues of Babel, Pentecost and Corinth were the same thing. He mixes verses from many books to make a linear narrative on the doctrine. His conclusion that tongues-speech in I Corinthians was obscure, his virulent anti-semitism, and narrow literalist interpretations all contributed to difficulty understanding this subject. He could not comprehend a Jewish antecedent as a background to Paul’s narrative of I Corinthians. The Spirit sounding within him? The old English version leaned on the Latin translation of the text which emphasized the idea of the Spirit sounding within (insonantes Spiritu) rather than the Greek which, according to Donnegan’s Greek Dictionary, believed Chrysostom used the word in other works to mean to teach or instruct.27 Secondly the Latin put the text into the ablative rather than keep the sense of the Greek genitive absolute. The reader may think that this is an innocuous point being made. There are a number of ways to understand the tongues miracle. The first one was that the person thought in their own language and as they began to speak, their thoughts were divinely intercepted and their lips produced sounds in different foreign languages, which the Latin translation could be understood leaning towards. It was an external miracle. Therefore there was little intellectual involvement on behalf of the speaker. Or it can be that the speaker spoke a single language, and the hearers heard in their own language. Another argument was that the miracle happened internally. The person miraculously understood and comprehended a language not previously known, had immediate fluency, along with full voluntary control of what he was saying, which the Greek tends to promote. The text illustrates that Chrysostom believed it was an internal miracle. He did not explain whether this was a temporary phenomenon with those at Pentecost, or that it persisted with them throughout their lives. The Corinthian tongues being a liturgical language? I Corinthians 14:15 See how this one gradually building the argument demonstrating that such a thing is not only unprofitable for everyone else, but for himself, if it is so, his mind is unfruitful? Chrysostom also pointed out that those previously who read or spoke in the religious liturgical language did not necessarily know what they were reading or saying. They were trained to simply read out the sounds, or speak them out from memory. It shows that this practice had been abandoned in the Antioch area by his time but not necessarily throughout the universal Christian community. He takes a position here that the person was spontaneously speaking in all the languages of the world. It is a broad statement which doesn’t explain the mechanics behind this. Was the person speaking a few words in one language, then switching to a second, and so on, until complete? Wouldn’t that take far too long? And would it be considered a miracle only to say a few words in each language and then switch to another? These questions are unfortunately not answered. Chrysostom himself realized this in his address on the doctrine of tongues in his homilies On the Holy Pentecost. He bluntly dived right in, stating that believers do not need signs. External things are insignificant. He knew his audience would not completely buy into this and added, “But I see that to be a teaching extending out for a long time. On which account I am going to bring an end to the word while adding a few thoughts.”32 He never completely finished the topic. It would have been helpful for posterity that he did. So he left us with a lot of question marks as to what he meant. Homily 29 on First Corinthians. Translated by Talbot W. Chambers. From Nicene and Post-Nicene Fathers, First Series, Vol. 12. Edited by Philip Schaff. (Buffalo, NY: Christian Literature Publishing Co., 1889.) Revised and edited for New Advent by Kevin Knight. http://www.newadvent.org/fathers/220129.htm. Acts of the Apostles. Homily XXXVIII, as found at New Advent. Translated by J. Walker, J. Sheppard and H. Browne, and revised by George B. Stevens. From Nicene and Post-Nicene Fathers, First Series, Vol. 11. Edited by Philip Schaff. (Buffalo, NY: Christian Literature Publishing Co., 1889.) Revised and edited for New Advent by Kevin Knight. See Augustine on the Tongues of Pentecost for more info. see Origen on the Gift of Tongues for more info. Homily 35 on First Corinthians. Translated by Talbot W. Chambers. From Nicene and Post-Nicene Fathers, First Series, Vol. 12. Edited by Philip Schaff. (Buffalo, NY: Christian Literature Publishing Co., 1889.) Revised and edited for New Advent by Kevin Knight. .
See Cyril of Alexandria on Tongues: Conclusions for more info.